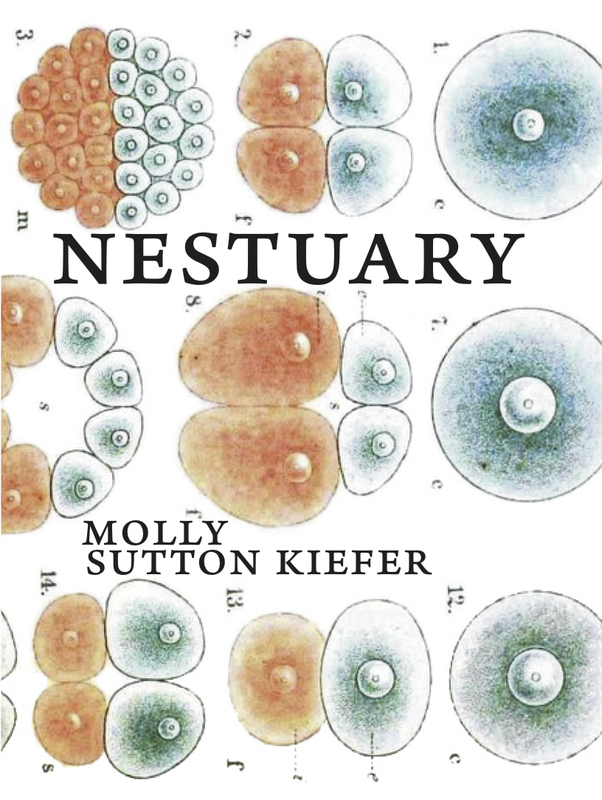 Nestuary, a lyric essay* by Molly Sutton Kiefer, is a tiny little book: under a hundred pages, scarcely bigger than a postcard. Yet within that small package, it contains multitudes. In telling the story of her struggles with infertility, pregnancy, and birth, Sutton Kiefer employs a multitude of forms, ranging from lists to poems, straightforward memoir to quirky dictionary definitions. She brings together allusions to classical mythology, news articles, and contemporary writing by the likes of Naomi Wolf and Sharon Olds. She also explores themes of illness, fertility, the body's functions and dysfunctions alongside the medical, social, and cultural expectations that color the experience of becoming and being a mother. This wide array of subjects and styles suits the book's title—this is the essay as bird's nest assemblage, with ideas and experiences picked up like bright bits of string, gradually forming a whole as they are woven together. I am wicked to my body. I lean into the mirror sometimes and say, "I hate you I hate you Ihateyou." The second section of the book details the ways in which Sutton Kiefer is "remarkably and unsurprisingly bad at being pregnant." She catalogues her nausea, her restless legs syndrome, the pain in her wrists, leading up to what feels like her body's greatest failure of all, the "failure to progress" that results in a C-section after 42 hours of labor. Sutton Kiefer's writing about this experience draws strength from the simplicity of the language she uses. "Failure begets shame, a kind of powerful, pumping horror," she writes, and the sentence stands out starkly amid the layers of allusion, quotation, and metaphor elsewhere in the text. The final third of the book brings motherhood: the raising of a daughter, a second pregnancy that goes more smoothly than the first, and the birth of a son. Anxiety still exists here, and worry over the body's inability to conform to expectations—now the breasts, producing milk in uncontrollable volume, become the locus of concern—but healing exists alongside it. After all that has gone before, it comes as a palpable relief when Sutton Kiefer writes, "It isn't the birth that is the hero of this story. The cause for physical triumph is instead the nesting-in, hiding-beneath-a-blanket-of-snow. I held her within long enough, and then I held her again without." At last she can give her body credit for what it has achieved and feel the joy of having what she has wanted for so long. At times, Sutton Kiefer ventures too far into the fantastical or the abstract, and her writing loses some of its power and immediacy. A series of imagined voicemails from a doctor, for instance, are difficult to connect to real experience: "You've played Chutes and Ladders. (It's not a question.) You have a rain barrel, a cellar door. You will trace your fingers, each square a project, a string of satellites pressed against the ceiling." When Sutton Kiefer sticks to concrete imagery, she is at her strongest. She depicts specific memories in clear and vivid prose with a poet's sense of economy, as when she describes her body "numbed like a winter-frozen carrot" during her C-section, or relates the earliest indications that there was "something a little askew" about her body: "My best friend knew to the hour when her blood would begin. Me, I would come home in a panic, frantically changing underwear, cursing the cramp and press, the unpredictability of my cycle." Any of Nestuary's individual pieces might be taken for a splinter, a tiny fragment with a glimmer of meaning clinging to it, but together, these bright slivers become something more. Through its many and varied pieces, its braiding of the confessional with the factual, Nestuary offers both a compelling personal narrative and an argument against the futility and harm—whether in the context of beauty standards or of birth—that is engendered when women are told we must hold our bodies to an impossible ideal. * A hybrid work of nonfiction that combines poetry and prose.